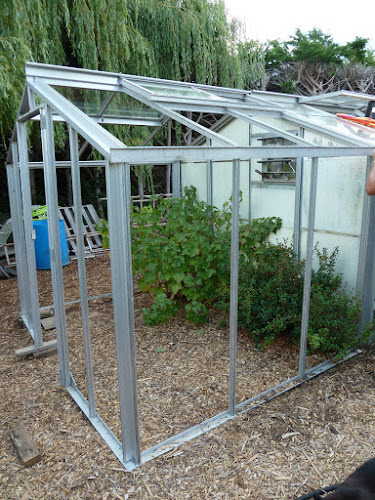 My Home and Garden: An addition to my greenhouse...oh joy!! Part one. An addition to my greenhouse...oh joy!! Part one. Allan regularly watches usedvictoria for another greenhouse for us. We wanted to put up a second one without a concrete pad...just soil and manure and put the citrus trees right in the ground in it. 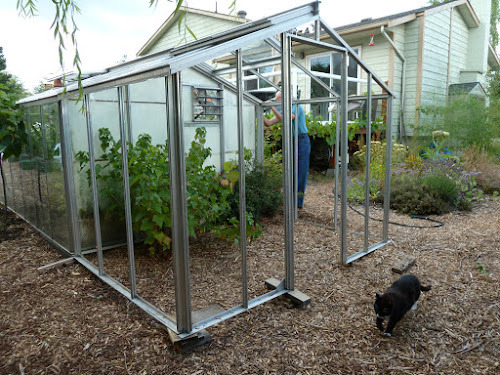 We lost out on two 8x12' greenhouses that have come up in the last year, but this weekend Allan found a small greenhouse 8x6' that is exactly like ours but shorter. What that means is that it can tack onto the existing greenhouse making it 8x18’ from the current 8x12'. It is tricky and will be a lot of work, but my greenhouse is growing by 50%. When we put the greenhouse up about 35 years ago, I situated it with the intention of buying a six foot extension when I had the money. It just didn't happen in the timeline I had envisioned. So better late than never. The plants that are within this new section are a Black Currant and two Chilean Guavas. There are not staying there, but the guavas are just setting their fruit so I am hoping we can build around them and move them in the fall. The Currant will be cut back and moved shortly. 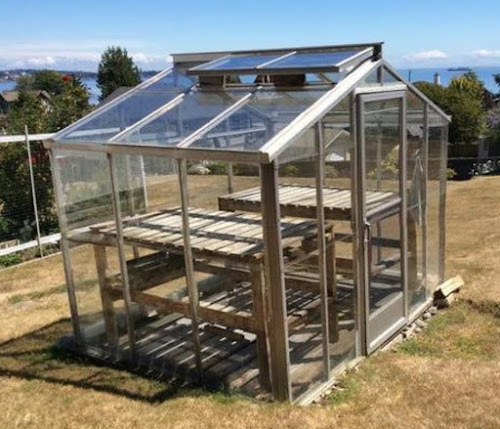 This is the photo from the ad for my greenhouse. I must say I do get a bit sad every time I see empty greenhouses. It's a greenhouse not reaching its full potential and dreams.